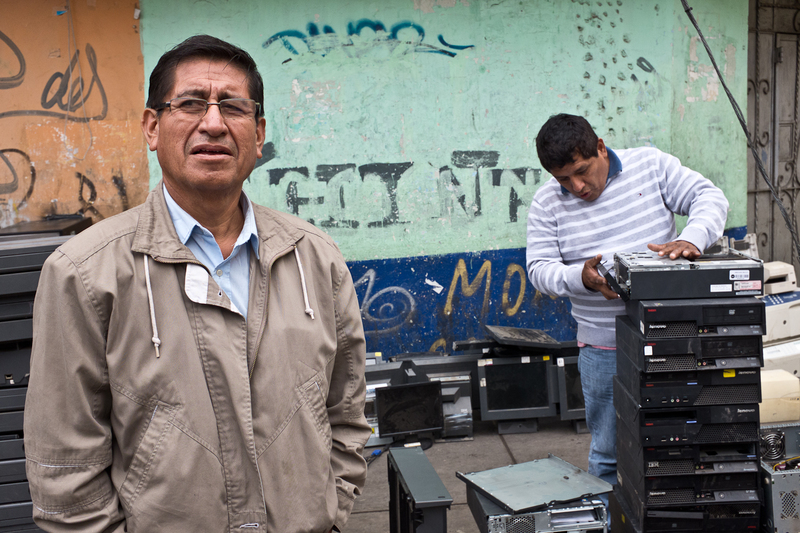 Senor Freddy (left) has been selling used electronics on Leticia street for nearly a decade. When asked why collectors and resellers such as himself don't organize to establish a government-recognized union of informal collectors/refurbishers, he shrugged. "It's too difficult to organize the other collectors." Other collectors and refurbishers noted that formalizing the informal sector would increase their costs, especially for disposing components such as CRTs that no longer have market value but contain hazardous materials that require safe handling. Other countries such as Brazil and India have formalized informal collectors and waste pickers into unions, thus providing the opportunity to engage more directly with other stakeholders in the formal sector. Nonetheless, another refurbished CRT TV vendor, Daniel Rodriguez (not shown) lamented, "I wish the NGOs and government officials would recognize our importance in keeping these productsout of the environment by extending their use. But they don't want to work with us."